At school, I loved understanding how things work and interact with each other in the world. I wanted to explore the biological world around me and Marine Biology was the perfect starting point. I chose Southampton because of its National Oceanographic Centre Southampton (NOCS), a world leading research facility for all things marine. I was very pleased to have the opportunity to study there, working on cutting edge research with some incredibly hi-tech equipment alongside world renowned tutors. 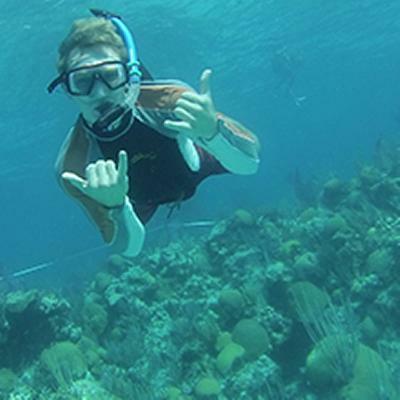 My MSci in Marine Biology gave me the opportunity to study in a diverse set of locations! I worked with complex underwater scanners while directing a 50ft research vessel off the coast of Cornwall. I worked in Bermuda in a secured underground rock pool with over 100,000 upside-down jellyfish! I also spent time in Dale Fort, Wales and Falmouth in Cornwall. What better way to learn about tropical biology than to swim with tropical turtles in Bermuda?! What other degree in the world lets you do that?! The teaching staff were great throughout my 4 years; the standard of teaching was very high and covered a vast range of information which gave me grounding in a range of disciplines. I benefitted greatly from the one-on-one tutoring because when I was struggling with my work, the researchers and lectures always took time out to meet with me. When conducting my final year thesis work, I worked very closely with my tutor who was very supportive throughout the whole process and gave me access to the aquarium at NOCS. I have dyslexia and I was fully supported during my time at Southampton. There was also support for non-academic aspects as well – from career development to personal welfare – all needs are catered for. I believe this, combined with the excellent facilities, led me to achieve a 1st class honours! I was involved in Enactus, Southampton’s biggest entrepreneurial society, for 4 years. I led a team that created and ran 11 social enterprises in the UK and abroad that focused on helping people in the local societies who were most in need. It was overwhelming to realise that in one year alone over 47,000 people benefited from one of our Enactus Projects, and being able to lead the team on that journey was a gratifying and humbling experience. Subsequently, we were the first ever UK team to be crowned World Champions at the Enactus World Cup event in Johannesburg. An incredible achievement, considering 70,500 students across 36 countries participated! I’ve been very lucky to have had the best university experience any student could have, but one of the most significant aspects of this is that I found a group of close friends who I have shared these experiences with and now that university is over, I’m very much looking forward to experience the next chapter of my life with them.